Gerald Rudolf Ford Jr (1913 – 2006) was a United States politician who served as the 38th President of the United States from 9th August 1974 to 20th January 1977. Born as Leslie Lynch King Jr, he studied at the University of Michigan and Yale School of Law. He served in the United States Naval Reserve during World War II and was a lieutenant commander by the time of his exit in 1946. Ford started his political career in 1949 serving from the 5th congressional district in Michigan. He served 25 years as a US representative and in the last nine years he was House Minority leader. Ford became Vice President after Spiro Agnew resigned and president after the resignation of Richard Nixon. The domestic policy of Ford is known for decreasing inflation and the rate of unemployment; and for reducing dependence on foreign oil. In foreign policy, among other things, he reduced tensions between the United States and the Soviet Union through the Helsinki Accords. 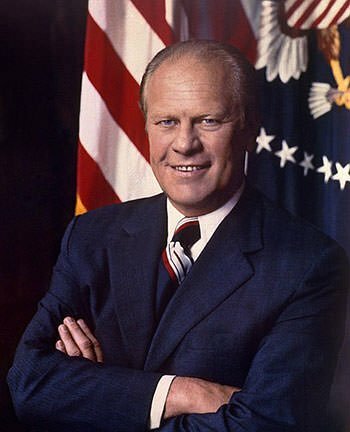 Know more about the contributions of President Gerald Ford through his 10 major accomplishments. Following the Japanese attack on Pearl Harbor on December 7, 1941, Gerald Ford enlisted in the navy. After one year as an instructor, Ford applied for sea duty. In May 1943, he was sent to the new aircraft carrier, USS Monterey. Ford served as the assistant navigator, athletic officer and anti-aircraft battery officer aboard Monterey. He participated in many actions in the Pacific Theater in late 1943 and 1944. 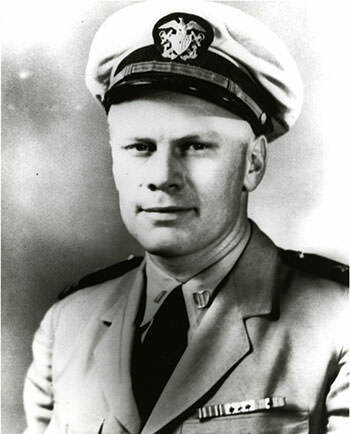 For his service in the Second World War, Lieutenant Commander Gerald Ford received the American Campaign Medal, the Asiatic-Pacific Campaign Medal, the Philippine Liberation Medal and the World War II Victory Medal. Gerald Ford served as a member of the U.S. House of Representatives for 25 years, holding Michigan’s 5th congressional district seat from January 3, 1949 to December 6, 1973. In November 1963, President Lyndon B. Johnson appointed Ford to the Warren Commission, a special task force set up to investigate the assassination of President John F. Kennedy. Ford then rose to the post of the House Minority Leader. He served in this capacity from January 3, 1965 to December 6, 1973. Among other things, as Minority Leader, Ford appeared in a popular series of televised press conferences in which he proposed Republican alternatives to the policies of Democrat President Lyndon B. Johnson. In 1973, U.S. Vice President Spiro Agnew was investigated on suspicion of conspiracy, bribery, extortion and tax fraud. On October 10, 1973, Agnew pleaded no contest to a single felony charge of tax evasion and resigned from office. This was followed by President Richard Nixon appointing Gerald Ford as his new vice president. The United States Senate voted 92 to 3 to confirm Ford on November 27. 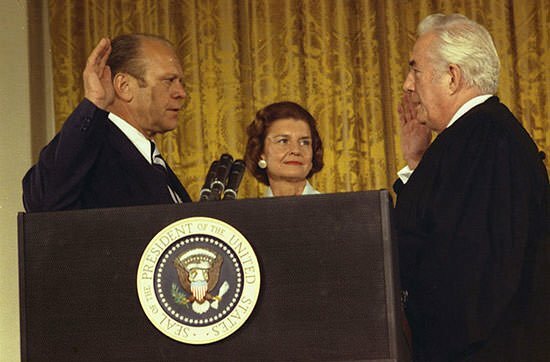 Ford served as the 40th Vice President of the United States from December 6, 1973 to August 9, 1974. In 1974, President Nixon’s role in the Watergate scandal came to light. 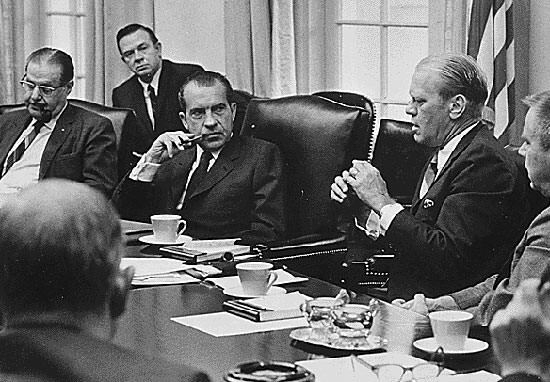 After Nixon resigned, Ford assumed the Presidency of the United States. Gerald Ford served as the 38th President of the United States from August 9, 1974 to January 20, 1977. Ford’s 895 day-long presidency is the shortest in U.S. history for any president who did not die in office. When Ford took office in 1974, the United States economy was going through a deep recession. The Gross Domestic Product (GDP) was on a near halt, and product prices were on an upward trend. In response, President Ford implemented a tax cut which was targeted at low and moderate income families. Reduction in taxes meant the households’ disposable income increased and so did their purchasing power. This, in turn, stimulated economic growth. Consumption as a percentage of GDP rose from an average of 61.7% in 1974 to 63.1% in 1975. It stayed at that higher level through 1979. 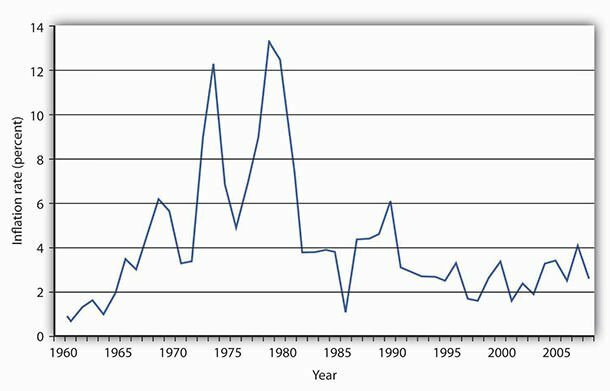 GDP per capita had been negative for all of 1974. Due to the policies of Ford, the rate of growth of real GDP averaged over 4% in the last three quarters of 1975 and in 1976, it was 3.8%. Thus Ford took the United States out of recession through his economic policies. Due to the economic crisis, the rate of inflation in the United States had gone up to 12.2% when Ford took over the presidency. To counter this, Ford went on national television and urged citizens to “make up a list of 10 ways you can save energy and fight inflation.” In a separate speech to Congress, he declared inflation was “public enemy number one” and asked Americans to wear the anti-inflation pins. This anti inflation campaign is known as Whip Inflation Now (WIN). It was a huge failure and is considered as “one of the biggest government public relations blunders ever”. However, Ford didn’t give up and he stimulated economic growth by increasing spending and cutting taxes. Due to this the inflation rate fell to 4.8% at the time he left office. The Ford administration thus decreased the inflation rate to less than half. The rate of unemployment rose from 4.8% in the fourth quarter of 1973 to 8.9% in the second quarter of 1975. As unemployment rose drastically, the Ford administration provided compensation to a higher percentage of unemployed than at any other time from 1967 to this day. At one time, in April 1975, 81% of all unemployed workers received compensation. Apart from providing compensation, Ford increased funds for Federal programs like Comprehensive Employment Training Act (CETA), summer youth employment and public service employment. 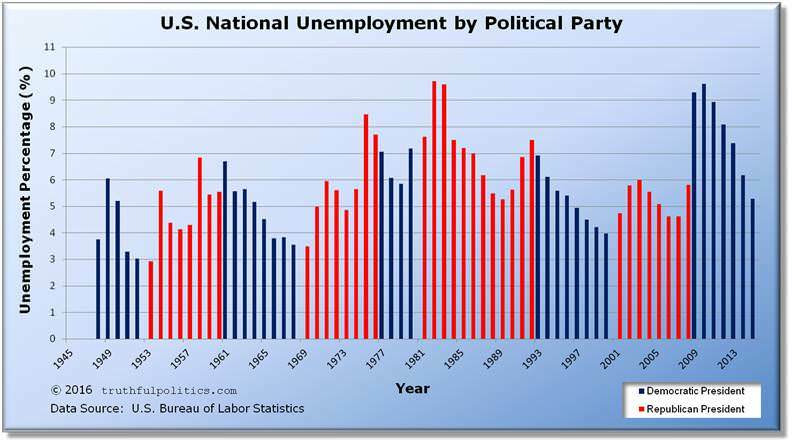 His policies also stimulated activity in the private sector thus creating new jobs. During the presidency of Ford, a total of 4 million jobs were created. The unemployment rate fell to 7.7% in 1976 and continued to fall for the rest of the decade. In 1973, a global oil crisis ensued as Arab countries proclaimed an oil embargo on nations supporting Israel against them in the 1973 Arab–Israeli War. United States, which was among the countries which had supported Israel, was hard hit by the crisis and the oil price in the nation skyrocketed. 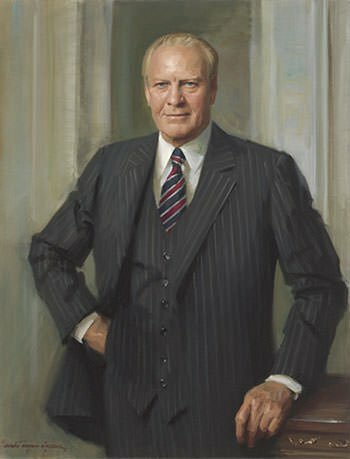 To counter the energy crisis, President Ford recommended to the Congress the first comprehensive national energy program specifically designed to reduce dependence on foreign oil. The plan aimed to increase domestic energy production and promoted conservation of scarce energy supplies. In December, Ford signed into law the Energy Policy and Conservation Act of 1975 (EPCA). Most notably, EPCA established the Strategic Petroleum Reserve, the Energy Conservation Program for Consumer Products and Corporate Average Fuel Economy regulations. Moreover, it reduced oil prices by approximately 12% and eliminated price controls for 40 months. President Ford’s farm policy was marked by non interference to the extent it was possible. This was in contrast to the policy of prescribing planting average and determination of crop prices by the government. Ford was also in favor of exporting excess produce rather than keeping large surpluses at great expense in government storage. During an address to farmers in Springfield, Illinois, Ford said, “We must sell grain, not pile it up in storage”. Net farm income in the three years of the Ford presidency averaged $28.5 billion as compared to $12.9 billion average during the previous three years. These three years were the highest on record in the terms of net farm income till that time. Also the value of agricultural products shipped to foreign countries in 1975-76 was $22.1 billion, more than triple of what they were in 1970. Détente was a policy which aimed to lessen tensions between the Soviet Union and the United States during the Cold War. Despite congressional opposition, Gerald Ford continued Nixon’s detente policies with the Soviet Union. In 1974, President Ford and the Soviet Union Prime Minister Leonid Brezhnev signed the Vladivostok Treaty which limited the use of jets and weaponry. 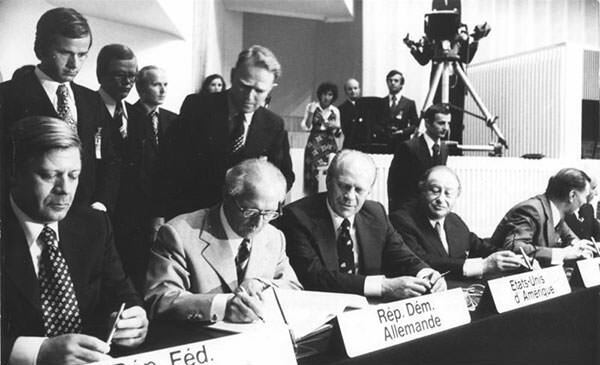 In 1975, the United States entered into an agreement with the Soviet Union and European nations popularly known as the Helsinki Accords. It formally acknowledged the post-world war II European borders and support of human rights. The Helsinki Accords is regarded as a significant step toward reducing Cold War tensions. Gerald Ford lost the 1976 presidential election to Democrat Jimmy Carter. Post presidency, he remained active in the Republican Party. In 1992, the U.S. Navy Memorial Foundation awarded Ford its Lone Sailor Award for his naval service and his subsequent government service. In 1999, he was honored with a Golden Palm Star on the Palm Springs Walk of Stars. The same year President Bill Clinton presented Gerald Ford with the Presidential Medal of Freedom, the highest civilian honor in the United States. In 2001, he was presented with the John F. Kennedy Profiles in Courage Award for his controversial decision to grant a presidential pardon to Richard Nixon. Internationally, Ford received the highest distinction of the Scout Association of Japan, the Golden Pheasant Award in 1974.